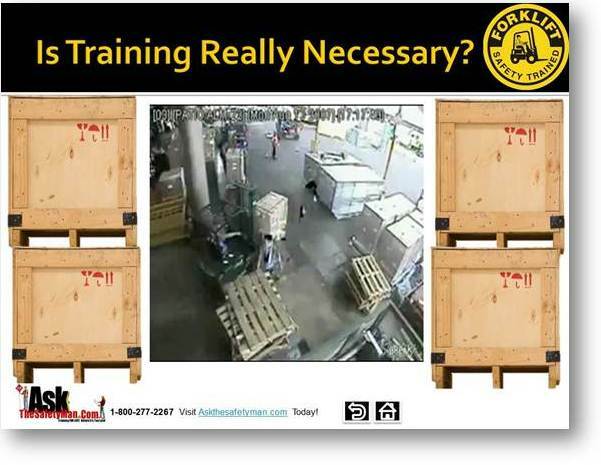 The forklift training program developed by Askthesafetyman.com is the most comprehensive forklift training package available. Our forklift / powered industrial truck safety training and certification package was developed directly from the federal OSHA forklift code, 29 CFR 1910.178. All OSHA mandated training topics are covered in this training package. Our employer forklift safety training package provides employers with everything needed to provide OSHA mandated formal instruction for powered industrial trucks. Lift Truck Training Packages Save Money! Employers can save significant money on their OSHA mandated training by purchasing training packages designed for employers with multiple lift truck operators. Askthesafetyman has incorporated all of the paperwork necessary to successfully set-up and manage ongoing training of equipment operator's at any facility. 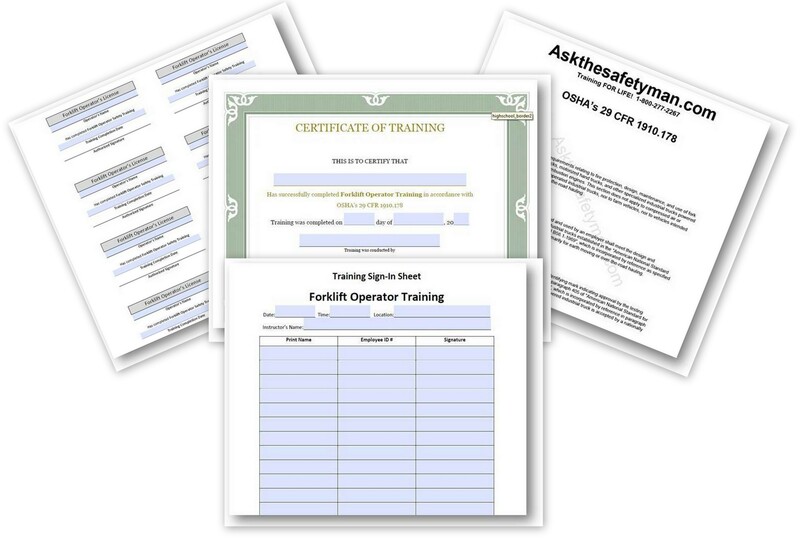 Training sign-in sheets, written tests, forklift code, inspection checklists, hands-on training evaluations, completion certificates and operator licenses! Why pay upwards of $179 per person for onsite training with some national companies? Save time, money and hassle, purchase an OSHA compliant forklift and lift truck training package today! Deliver the course material with an experienced trainer or equipment operator, supervisor or manager or set it up as a training-on-demand tool on a PC. Equipment trainees can start, stop and resume their training as their schedule permits, even on the graveyard shift! We created form fillable PDF document templates that you can fill out and save on the computer to maintain accurate training records. The forms are great! Type in the information, tab to the next field, complete and save the forms! This means that the t raining can be presented for group training, or it can be used as an individual operator training-on-demand system. Set-up any computer with the employer’s forklift training program and employees can complete training as your workforce scheduling permits! Our training development team utilized clear high definition video and photos throughout the training program to highlight important training detail. The employer forklift training program includes clear computer animations to illustrate complex material in a simple, easy to understand format. This makes learning easier for participants and generates deeper understanding and comprehension of the training materials. Industry standard terms and definitions specific to material handling equipment and logistics and manufacturing environments are immersed throughout the training program providing participants with a broader understanding of equipment and workplace terminology. Full text reference copies of OSHA’s 29 CFR 1910.178 forklift code have been included in the training program as well as a PDF printable copy for use and reference within your facility! 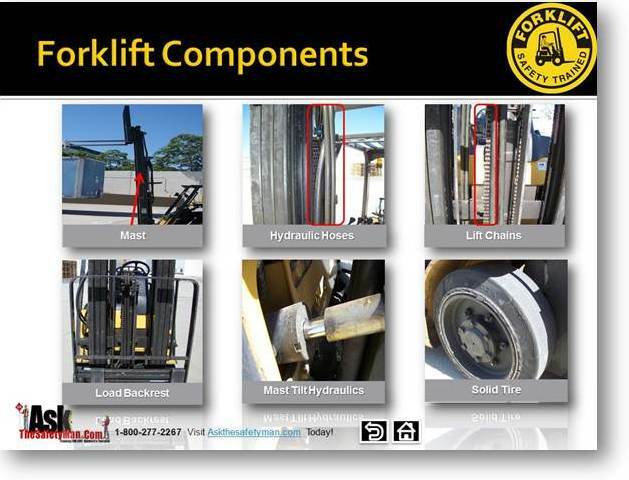 Real life forklift accident videos have been included and used throughout the program to illustrate actual accidents for the material being presented. For example, trainees may see forklift tip over accidents in the modules covering lateral and longitudinal stability. Videos contain no graphic material. Your forklift operator trainees will benefit tremendously from seeing exactly why rules, processes and procedures are the way they are. Numerous video examples will clearly illustrate the right way and wrong way to operate. Use of these short video segments is designed to generate conversation with the instructor, allowing more critical thinking when questions are asked as to, "What happened? ", "What did the operator do wrong? ", "What was the effect of this accident on the operator and the company?" which leads to a more comprehensive understanding of safe equipment operating techniques. OSHA requires that every employee who is required or expected to operate material handling equipment such as forklifts or more specialized material handling equipment such as swing-reach trucks, order pickers, walkie riders, stand-up forklifts, counter balanced forklifts, etc. receive equipment specific training for every piece of equipment the employer expects the employee to operate. The training must encompass a formal education component such as classroom / lecture or online training to provide instruction on all OSHA required training subjects. This formalized training should include, while not mandated by code, a knowledge check in the form of a test or exam at the conclusion of the formal training in order to test, verify and document comprehension and understanding. The second portion of the training requires that equipment operators be given a practical demonstration of the equipment and comprehensive hands-on training for each type of equipment they will de required to operate. Participants shall observe proper operation, receive practical demonstration and instruction and be allowed time to practice operating the equipment, under supervision, to ensure they are comfortable and familiar with equipment operation, handling and control surfaces. Forklift and material handling equipment trainees shall then be tested to ensure they are capable of safely completing the outlined tasks such as approaching loads, lifting, steering, traveling, maneuvering, safe operation, etc. Once the trainee has successfully completed the hands-on portion of the training they can be issued the operator's license and completion certificate. Employers should team the new operator with an experienced operator for mentoring and monitoring of the new operators performance to ensure safe and appropriate operation of the equipment in and around the facility and pedestrians on the floor. Providing OSHA required forklift safety training, Askthesafetyman.com also offers onsite group training for businesses throughout most of California, including San Diego, Riverside, Los Angeles and Orange counties. If getting all of your employees together in one place at one time isn’t feasible, we offer online forklift training as well. 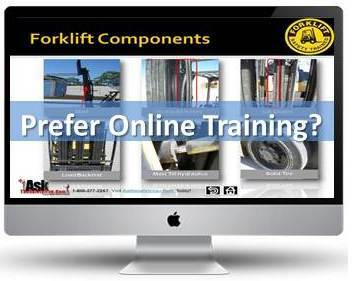 Training online allows your operators to start, stop and resume their online forklift safety training as their workload permits. Participants must complete all OSHA mandated training modules and pass the certification exam with a minimum passing score of 70%. Does OSHA Require Me to Hire a Professional Instructor? No. OSHA requires that an individual with sufficient training and / or experience provide the training. However, OSHA does require that your designated trainer provide training that sufficiently covers all of the required training topics as outlined in 29 CFR 1910.178. So, your experienced equipment operator, supervisors, etc. can deliver in house training. Simply purchase a training package that provides them the information and resources to ensure the training is sufficiently comprehensive to cover all the required training. The training must also be delivered in the employee's native language. This means that employees who do not possess a significant grasp of English, because they are say Spanish speaking, those employees must receive their equipment training in Spanish to ensure that trainees understand the information presented. Can Employees with No Valid Driver's Licenses be Forklift Certified? Yes, there is currently no requirement that operators have valid motor vehicle licenses. HOWEVER, we strongly discourage employers from certifying employee operators who do not have valid motor vehicle licenses as they lack the familiarity with operating skills and experience that will be necessary in the material handling equipment environment. All operators who drive equipment on public roadways should possess valid motor vehicle licenses. Your operator's MUST be at least 18 years of age. OSHA does not permit any operators younger than 18 to operate forklifts or other forms of manual material handling equipment.